Go Green! 12 Great Recycled Craft Ideas! You don’t have to spend a lot on supplies for children to enjoy creating interesting projects. 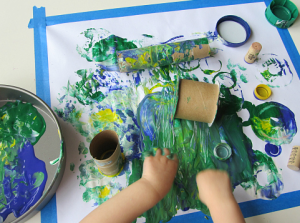 Check out these suggestions from PBS Kids for re-using boxes, paper towel tubes, and more. You can start with these ideas and let the children come up with even more. Best of all, it is making use of materials that might otherwise fill up the trash!